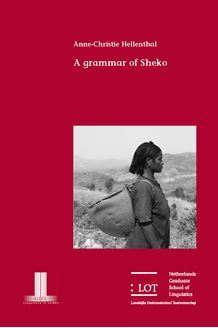 This thesis investigates the grammar of Sheko , an Omotic language spoken in southwest Ethiopia . The study presents an analysis of the phonology , morphology and syntax of the language , amply illustrated by examples . The supplements contain a sample of texts and an extensive word list . Among other things , the author discusses the interrelation between gender , definiteness and number in nominal morphology . Some nominal morphology also occurs on verbal forms . In the verb system , stem formation , aspectual and modal distinctions as well as stance marking are treated . The language has a rich array of complex verb constructions , such as medial clauses and serial verb constructions , next to different types of subordinate clauses . In relative clauses , a resumptive pronoun may occur before the antecedent . One of the divergent ways in which interrogatives are formed is by â subtractive morphology â , i.e . dropping off a grammatical element which is obligatorily present in declaratives . Furthermore , subject clitics attach to a variety of hosts in correlation to information structure and focus . These and a number of other issues make the work valuable for specialists of Omotic and Afroasiatic studies as well as for general linguists and anyone interested in the typology of language .